In 2000, I took an interest in the PSK31 digital mode designed by Peter Martinez, G3PLX. A good article by G3PLX about this mode can be found on the ARRL Website. This mode is ideally suited to QRP operation, having a bandwidth of only 31Hz and there is plenty of activity on the HF bands. Although I was interested in the technical aspects of the mode, I found operating it became quite boring as many QSOs seem to consist of people just sending a preset collection of text macros. This is the equivalent of "rubber stamp" CW QSOs but with no skill attached, which is why I rarely use the mode nowadays. Hardware requirements to implement PSK31 are modest. 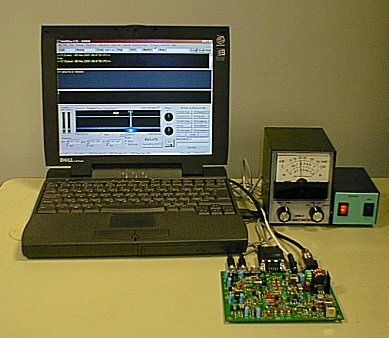 No expensive TNC or Decoder is required, a PC Soundcard is used instead. I built the simple interface shown on the left. It's primary purpose is to isolate the PC's ground from that of the Transceiver. 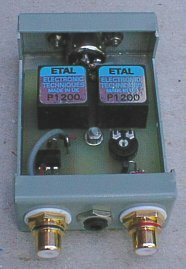 A pair of 1:1 transformers salvaged from some V32bis modems isolate the RX and TX audio and an optoisolator provides isolation of the PTT signal. I have made up separate interface leads to be able to connect to either the IC735 or IC706mkIIG. Some problems were experienced with the PTT function and IC706. It seems the IC706 needs a very low resistance ground, so the optoisolator was replaced with a reed relay, which provides more reliable operation. I have revisited this issue and found a CNY17-3 will reliably key the PTT. Probably the best component to use is the PS7141-1A solid-state relay. Suitable Interface schematics can be found on K4ABT's Website, who markets the ISO-Kit range of interface kits. Some of the commercial interfaces are quite expensive, considering how few components are contained inside their pretty boxes. I'm currently using a homemade "Prodata" interface from the design by Bob Lewis, AA4PB, in March 2002 QST. This is much better (and cheaper!) than many of the commercial interfaces and is designed for use with Icom transceivers. One of the best commercial interfaces is the excellent MixW RigExpert. The Signalink USB is also a popular interface and like the Rigexpert has a built-in soundcard IC, resulting in less cables in the shack. My old PC PC was a 700Mhz Pentium III with 512Mb running Windows 2000 Professional and a Soundblaster PCI64 card. The performance was more than adequate for PSK31. Software requirements are also modest, as almost all the popular PSK31 programs are freeware. I started with Digipan, which is quite intuitive to use. As well as Digipan, I have also tried some of the other PSK freeware programs and although they all seem fairly similar, I favoured Hamscope, which also runs CW, RTTY and MFSK16 modes and interfaces directly to my logging program, YPLog. Probably one of the best programs for the digital modes is MixW, especially if used with the companion Rigexpert interface. This is an incredibly powerful program which supports all digital modes. It will also send CW using paddles via the parallel port. However, the freeware FLDigi is now gaining popularity as it runs on various platforms and supports many modes. 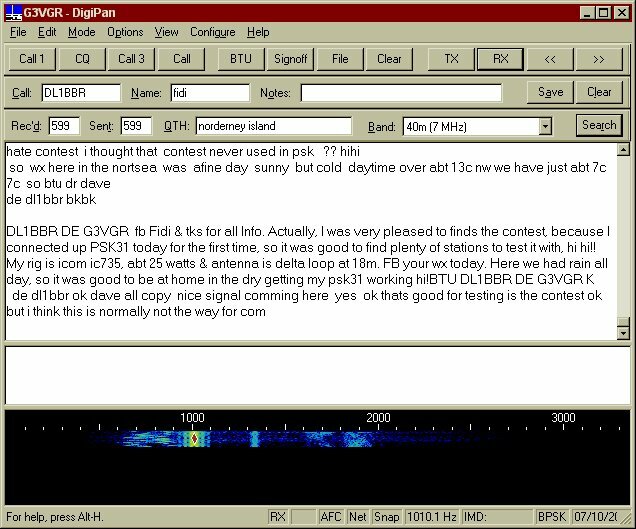 This is an example of a PSK31 QSO using Digipan. The bottom window shows the "waterfall" tuning aid. The diamond is centered on the received signal from DL1BBR. Tuning of received PSK31 signals is accomplished by a mouse click on any one of the multiple displayed signals. Although the PSK31 system has no error checking and correction, the narrow bandwidth imparts a good signal to noise ratio, resulting in a quite robust system. I've also built the PSK20 kit from Small Wonder Labs. This kit is basically a PSK31 "appliance", being a crystal-controlled 20 metre transceiver optimised for the PSK mode. The PSK20 interfaces direct to a PC and is intended for use with Digipan, although WinPSKse now supports it. The complete transceiver is implemented on a 5.25"x4.5" PCB. The kit took around 8 hours to build, Dave Benson's documentation was of it's normal high standard, reminding me of the old Heathkit manuals. After a quick visual check, I connected a laptop and antenna to the PCB, then switched it on for a smoke test. Not only did it work immediately, it was happily receiving PSK stations before any alignment. This really impressed me, so much so that it wasn't until the band went dead that I eventually started the alignment procedure. Alignment wasn't too difficult, although I deviated from the procedure set out by NN1G. I had some problems when using Digipan to align the carrier oscillator and found it was much easier to use the spectrum display on WinPSKse to centre the filter passband. After alignment, my PSK20 transmits a steady 2 watts output, as can be seen on the OHR WM2 meter in the photo. Even this fleapower has resulted in many 20 metre QSOs.